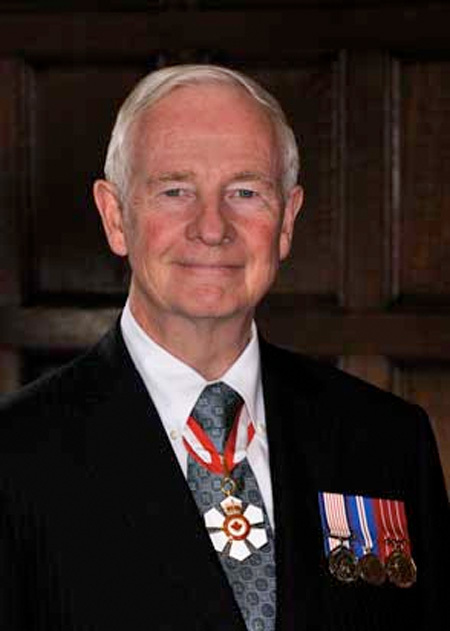 The Sons of Scotland have been awarded the Caring Canadian Award by His Excellency the Right Honourable David Johnston. 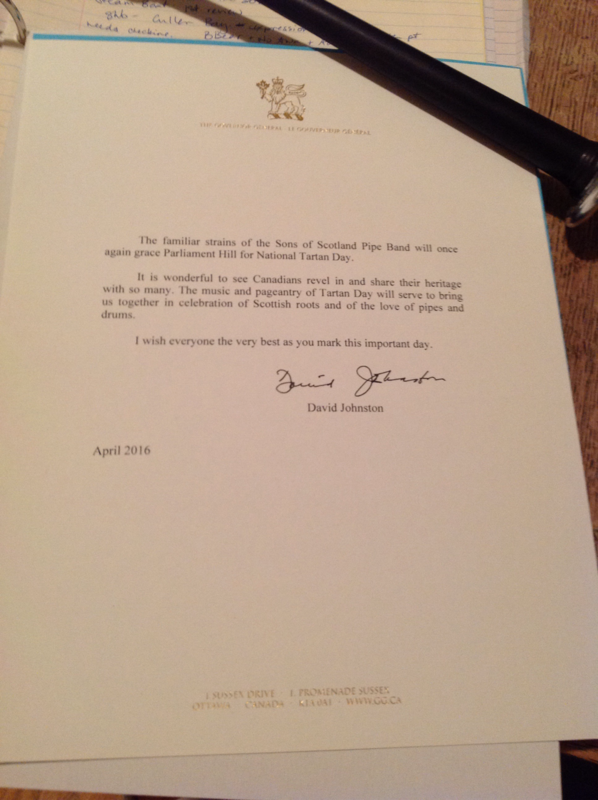 The ceremony took place on April 7, 2014 at Rideau Hall, and members of the band were given pins on behalf of the pipe band. 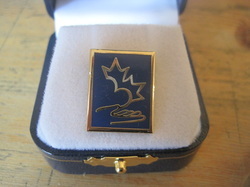 ​These are now replaced by the Sovereign Medal for Volunteers. Active since 1876, Sons of Scotland is a fraternal association for Scottish people and their descendants. 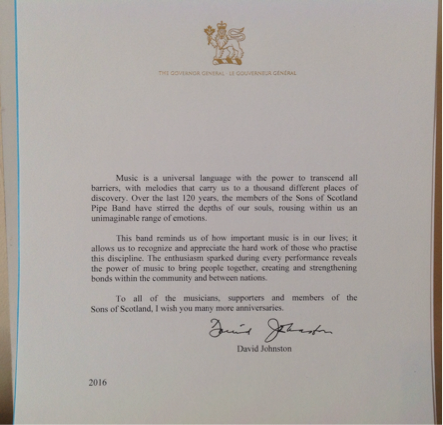 They seek to preserve and promote Scottish heritage and culture in Canada, by keeping alive the great traditions of history, literature and the music of Scotland. The first Sons of Scotland Camp was the Robert Burns camp No. 1 in Toronto. It was organized on June 27th, 1876. By 1892, 70 Camps had been formed and the total membership was around 6,000 individuals. An article written in 1892 in "The Scottish Canadian" said that the rapid progress of the Order had been phenomenal. To quote the article,” From being weak and struggling, it has struck its roots deeply and spread its branches until now it is financially strong and among the best benevolent societies in the country." Camp Argyle No. 26 was formed in 1891 in Ottawa. By 1895 it had 158 members. Within a year of its founding, camp Argyle was firmly established in the Ottawa social spectrum. It meetings were described as the best attended of any society in the capital. Brother D.L. McLean, an Ottawa Barrister was the only member of Camp Argyle who has been elected Grand Chief of the Association. He Organized the Camp's first pipe band led by Pipe Major Brother James Anderson. In 1896, on the one hundredth anniversary of the death of the Scottish bard Robert Burns, the band played in Ottawa for the first time. 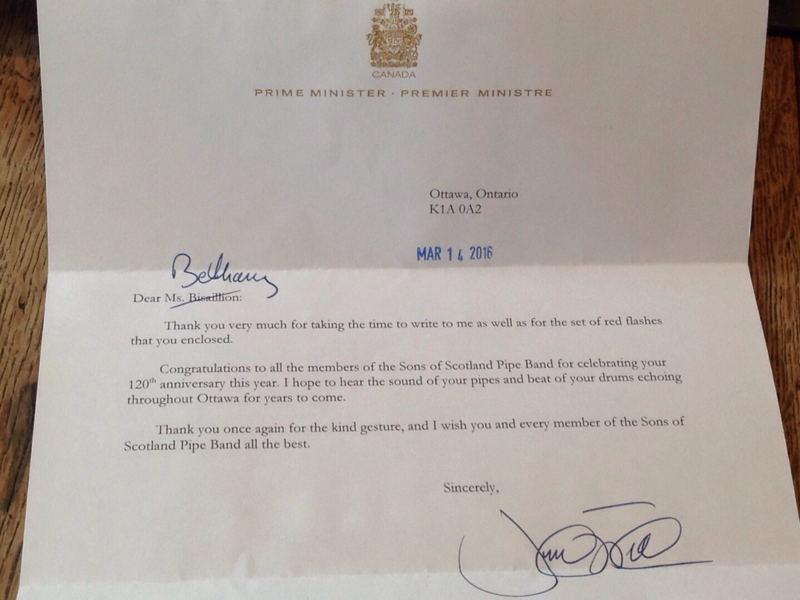 It was in fact the first pipe band to be heard in the nation's capital. In the early years of the century, Camp Argyle was the principal camp in what was then District No. 12 - the Ottawa Valley area. In the region there were active camps in Carleton Place (Diamond Jubilee No. 67), Almonte (Blue Bell No. 62), Renfrew (Greenlaw No. 68), Smith Falls (MacBeth No. 85), Lanark (Ellerslie) McDonalds Corners (Dalhousie no. 118), and Arnprior (Thistle). The Scottish philanthropist, Andrew Carnegie, was given honorary membership in Camp Argyle during his visit to Ottawa in 1906 for the opening ceremonies of the Carnegie Library. The Sons of Scotland organization pioneered the protection of its members through low-cost insurance premiums that provided much-needed peace of mind and medical attention when needed. Camp doctors and pharmacists were office bearers until the mid-sixties. The Camp doctor was to provide free medical attention to all camp members (excluding surgical and maternity cases), as stipulated in an agreement drawn up in 1925 between Camp argyle and Dr. Gideon O. Barclay. Today Camp Argyle is a proud supporter of the Alzheimer’s Society of Ottawa, and maintains a Scholarship Fund for member’s children. The Sons of Scotland Pipe Band is proud of its sponsors and supports their activities by pursuing the traditional Scottish arts. We perform for them several times a year and enjoy their support year-round.